Come for the beauty, stay to learn more! 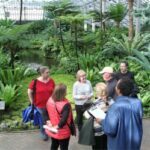 With the Garfield Park Conservatory gardens as the backdrop and classroom, adult learners can get hands-on experience with our knowledgeable staff and volunteers. Our Adult Programs range from a casual drop-in to in-depth classes and workshops, providing a place to expand your knowledge. For those wanting a long-term learning experience, please check out our volunteer program page for more information. 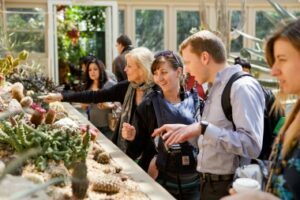 Take your adult group to the Conservatory for a warm reprieve in the winter, or a beautiful oasis in the summer. Whether you are organizing a casual visit for your adult group or would like a guided tour, please click here for details and registration. Every second Wednesday, our free lectures cover a range of topics that help us answer how plants and nature shape our identities. From food choices, to cultural uses of plants, to how we experience nature, the topics will dive into a different area each month. Check our calendar for upcoming lectures. 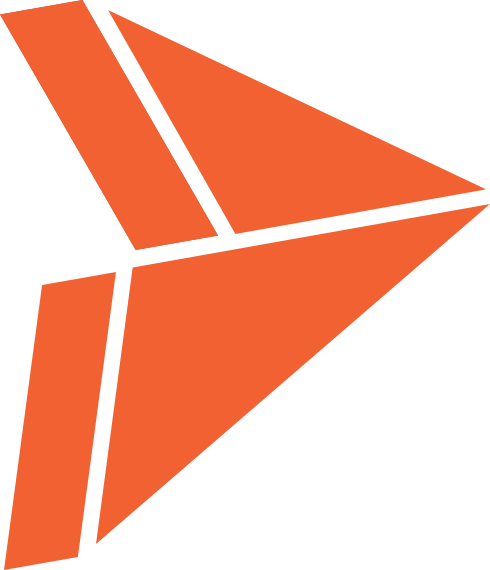 Access your very own, on-demand tour guide! Use your smartphone or tablet to navigate at your own pace, and soak up as much information as you desire with images, video and audio features. 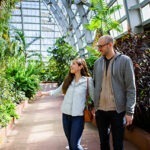 New tours are added regularly, with options for the individual visitor and the whole family. To access on your phone or tablet: download the Vamonde app from iTunes or GooglePlay. To access the tours via web, visit Vamonde.com. Every Saturday June through September, our volunteers cover the topics of beekeeping, composting and gardening in hands-on demonstrations. Drop-in anytime between 11am-12:30pm on Saturdays to learn from our expert volunteers and staff. Beekeepers are also out every Tuesday from 11am-12:30pm. From October through May, our composters move indoors to showcase worm bin composting on Saturdays from 11-12:30pm. Relax and revive with yoga at the Conservatory! Our free yoga sessions are the 2nd and 4th Saturdays each month from 9am-10am. 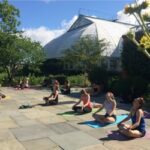 These sessions are meant for any level and will happen outside on the Bluestone Terrace on nice days or inside Horticulture Hall when it is cold or inclement weather! Bring your own mat and $5 suggested donation. Keep an eye our for one of our ‘Wandering Guides’. These trained and knowledgeable volunteers will be around to answer your questions and will happily point out plants they find extraordinary. Times vary but look for them in a green apron. 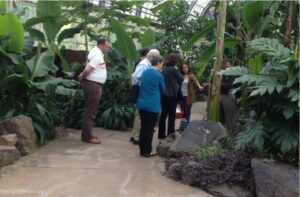 Our Private Group Tours focus on Plants and History, Tropical Treats, Behind-the-Scenes and more topics to come. Each of these private tours are scheduled upon request. Tours cost $10 per person; we can schedule up to 45 people for a guided tour, however, we have a minimum of $100 per tour. We request at least two weeks advance notice to ensure we can accommodate your group. You will receive a confirmation of your tour date and time from our Registrar once we confirm our guides. We offer two levels of beekeeping classes: Beginning Beekeeping is a 5 hour class that takes you from the basics to the realities of managing an urban beehive and Beyond Basic Beekeeping is a 3.5 hour class with an up close look at our campus hives which you go through to see what is ‘normal’ and what may need to be troubleshooted. 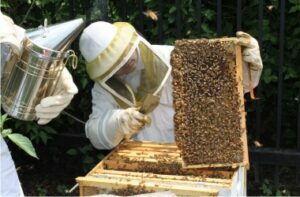 Beginning Beekeeping is typically offered October through March, in preparation for the upcoming season. Beyond Basics is offered in the warmer months so novice and advance beekeepers can get into our active hives. Please check the calendar for dates and registration. 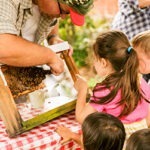 If you’d like to learn more about keeping bees, you can also stop by the drop-in demonstrations on Tuesdays & Saturdays from 11-12:30pm in June through September. For all fee-based programs and tours, we are able to provide full refunds up to two weeks prior to the program date. Within two weeks, we can offer a credit for a future class, or a refund in the event that we have a waitlist for the program and we can fill your spot.